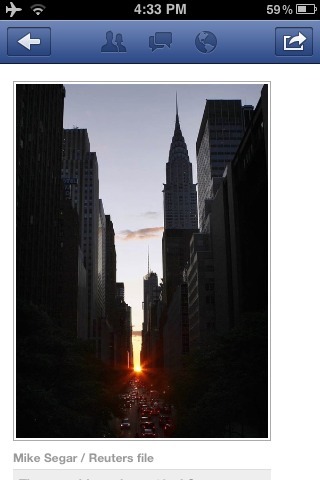 Astronomy Israel: "Manhattanhenge" - Tonight! Here we are in the US, not far from Manhattan, with the celebrated "Manhattanhenge" event, as named by Neil DeGrasse Tyson, about to occur. This event occurs around Memorial Day every year when the setting sun aligns with the canyon towers of the Big Apple, casting its sunset glow from west to east across the island. In homage to the great rocks in England at Stonehenge which were used to mark the summer solstice, physicist Tyson named this occurrence in Manhattan after them. 8:16 pm this evening at sunset.